If you've been reading my blog over the last few weeks you'll have seen that despite being on a family holiday I still managed to capture images from Dalveen Pass, Kilchurn Castle, and Glen Etive. I even managed to make the experiences into some 5 Minute Photo Adventure videos. This was far more photography that I could have hoped for or even planned for. So when I finally finished my holiday in Scotland and started the journey back I expected that was the end of my photography activities for this holiday. However, as with the idea behind shooting Dalveen Pass, I thought I might be able to do something similar for the journey back. So yet again I picked up my copy of Photographing Scotland and looked for a suitable location. Almost on the opposite side of the M74 from Dalveen Pass, I found the location called Grey Mare's Tail. It looked perfect. Only a few miles off my route it had a big waterfall and a beautiful loch. I had a plan. I would drop my family off at Glasgow Airport, drive down the M74 and then stop and grab some images. I departed for Glasgow Airport early in the morning and I soon started driving along the banks of Loch Awe. To my surprise there the water was calm and there was a lot of low lying mist hanging over the water. I already knew before I got to Kilchurn Castle that the conditions for taking photographs there would almost be perfect. Glassy water, low lying mist and a ruined castle…what more could you want? It broke my heart to drive past Kilchurn Castle that morning. I could have taken some amazing photographs but I had to get to the airport. There simply wasn't time to stop. The amazing conditions didn't stop there though. All along the route to Glasgow, there was mist and the low-level cloud hanging about over water. As I approached Loch Lomond I was sure there was a cloud inversion and if I'd had time to ascend Ben Lomond I would have been treated to an epic show! The conditions weren't ideal, and I was really short of time, but this is definitely a location I need to revisit. There is a lot of different spots along the path past the waterfalls and up along the loch side. I wish I could have spent all day there. However, now I know where it is and what to expect, it's definitely getting added to my custom Google locations map. 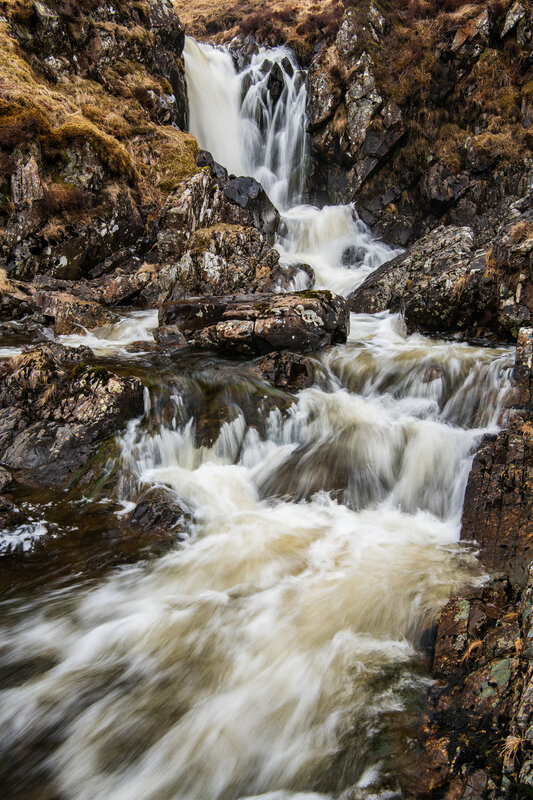 Have you visited Grey Mare's Tail before? Did you make the ascent all the way up to Loch Skene? Let me know in the comments below. Here are some of the images I captured during my brief time at Grey Mare's Tail and Loch Skeen (Skene). Nikon D850, Nikkor 24-70mm f/2.8 @ 52mm, f/11, 25 seconds at ISO 64, Lee Filters Circular Polariser and 10 stop ProGlass IRND. Nikon D850, Nikkor 24-70mm f/2.8 @ 32mm, f/11, 13 seconds at ISO 64, Lee Filters Circular Polariser and 10 stop ProGlass IRND. Nikon D850, Nikkor 24-70mm f/2.8 @ 34mm, f/13, 1/8th seconds at ISO 64, Lee Filters Circular Polariser.